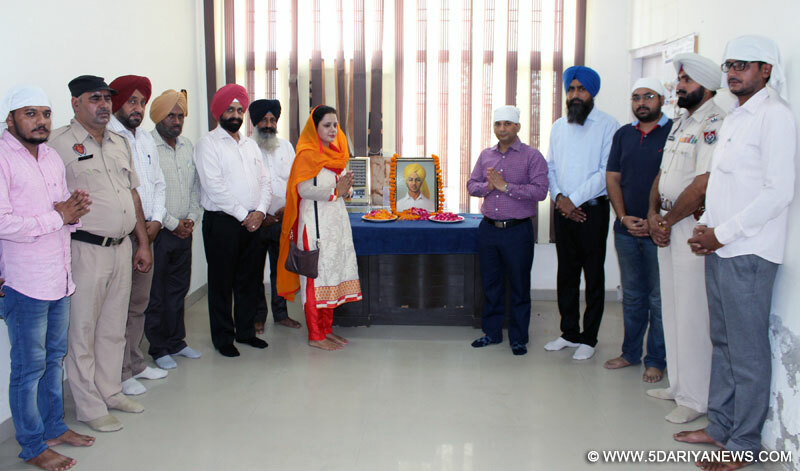 Deputy Commissioner Ravi Bhagat today paid tributes to Shaheed Bhagat Singh on his birth anniversary at a brief function organised in SDM Office, Raikot, today.He was also accompanied by SDM Raikot Miss Kanu Thind, District Public Relations Officer Mr Prabhdeep Singh Nathowal, besides others.Mr Ravi Bhagat said that Shaheed Bhagat Singh was a legendary freedom fighter who, along with other great freedom fighters, laid his life for the country. He said that Shaheed Bhagat Singh is not only a great freedom fighter but also a youth icon. The Deputy Commissioner said that today’s youth should follow his teachings because every moment of his life was purposeful. On this occasion, the entire staff of SDM Office Jagraon also paid floral tributes to Shaheed Bhagat Singh.